Europe’s silence at the jailing of sacked Catalan ministers has sparked outrage among the pro-independence movement. Expressing their dismay, around 150 people gathered in Brussels on Friday night for a protest in front of the EU institutions. For demonstrators, the separatist politicians placed in pre-trial custody are political prisoners. And they deplore the lack of reaction from the EU and its members states. “It’s shameful,” said one Portuguese protester. Ousted Catalan leader Carles Puigdemont remains the legitimate president, according to a Catalan woman we spoke to in the crowd. 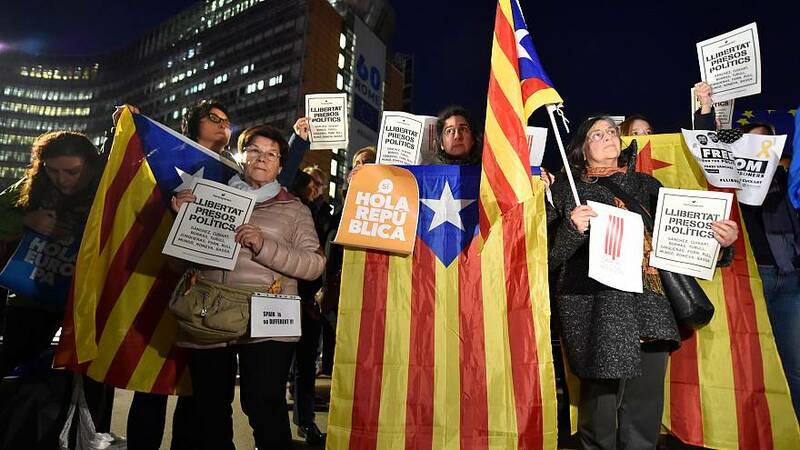 “He should never have been sacked, and standing in the elections is a way of bringing back what should never have gone,” she said, referring to Puigdemont’s announcement that he is ready to stand in the snap poll called by the Spanish government in Catalonia on December 21. Another Catalan woman reflected, with irony, that recent developments have strengthened resolve. “When all this is over and Catalonia is independent, we will have to give an award to Spanish Prime Minister Mariano Rajoy for all he has done for the cause,” she said. The protest was held as some European politicians also slammed the EU for its handling of the crisis.